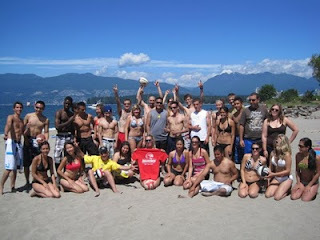 Douglas College students hit Kits Beach on Sunday July 18 for a day of sun, sand, surf and the Vancouver Open 6-on-6 volleyball tournament. Two teams representing the College competed: Team Explore, made up of exchange students from Quebec visiting Douglas College for a four-week language exchange, and Team Royals, made up of current Douglas students. Team Royals went on to finish second in the tournament, while everyone else enjoyed the sunshine, live music, a barbecue and a dip in the ocean. For more information on future Campus Life events, please visit the Centre for Campus Life.